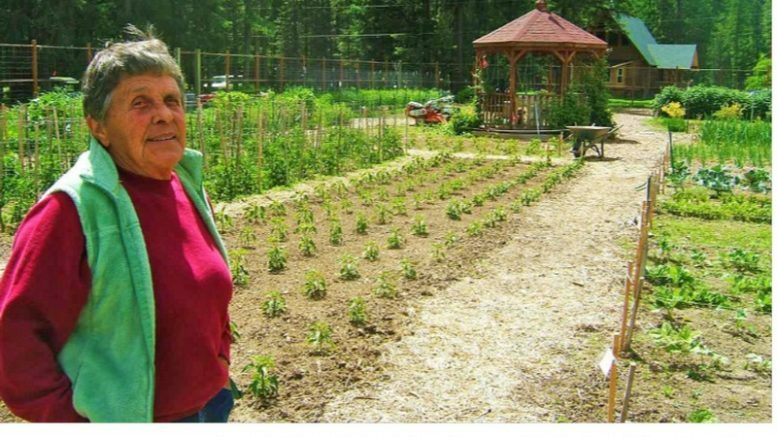 When Joanne Fry and her husband Jerry moved to Pipe Creek Road out-side of Libby in 2002, she thought she would plant a garden. She hired some-one to rototill a sunny place about the size of an Olympic swimming pool, she put up some deer fencing, and she started planting. Now, 17 years later, Joanne’s Garden of Eat’in is a local treasure of fresh, delicious, organic, and completely locally-sourced produce. Joanne wasn’t always a gardener; in fact, she and her late husband Jerry spent many years sailing the world’s waters. “My husband and I were boat people,” she said wistfully, “and when we were sail-ing, no, I didn’t garden.” she told The Montanian with a grin. In between sailing journeys to Hawaii, Panama, and the Atlantic coast, to name a few, they would build a house, sell it and buy the next boat, Fry said. What made the Frys decide to settle down here, she did not reveal, but Joanne jumped into gardening with the same focused fervor that she had for sailing. She began planting every vegetable you can name, all from seeds and she still keeps them. “I save some spinach seeds, a variety called Whale, (named for its gi-ant leaves),” she said, “because only one seed company has it. And I’ve been saving a certain vari-ety of sweet pepper for years; it’s no longer a hy-brid, its my own strain now,” Fry told The Monta-nian. Joanne doesn’t charge for her bounty, but most folks gladly put cash in her donation jar. “What peo-ple donate covers about 1/3 of the cost of the gar-den. It’s about $1,200 per season,” Fry said. Joanne welcomes kids, and they absolutely love her garden. She has a cou-ple of butterfly nets wait-ing for young visitors who she gets to help her con-trol white cabbage moths. “I tell them I will give them a nickel for every bad white butterfly they catch,” she said. Joanne uses nothing but her own compost and mink manure from a mink farm down the road. Mink manure is great, she said, because minks, being meat-eaters, are not full of grass seed. During the hot, dry summer, the garden gets watered by a combination of overhead rain birds, lawn sprinklers, and soak-er hoses. The county crews reg-ularly drop off piles of woodchips, which Fry us-es to cover the wide, wheelchair accessible paths that crisscross her garden. Fry donated her lefto-ver peppers to Libby’s food bank. “One of the reasons I grow, is because people can’t afford to pay a dollar a beet,” she said. Joanne’s Garden of Eat’in, this year, is every bit as vibrant, gorgeous, and bounteous as ever. The strawberries and snow peas will be ready soon. Come on out! Joanne Fry in her garden. Photo by Moira Blazi, The Montanian.